When choosing a clothes dryer for your home, there’s a lot to consider. Clothes dryers are constantly being upgraded to help improve the drying process and energy efficiency. The Italian home appliance manufacturer Smeg offers condenser dryers, heat pump dryers and washer/dryer combos, boasting the latest technology and features to ease your load. With large drying capacities of 7kg and above, let’s dive into the range and see what’s on offer. A condenser clothes dryer is designed to utilise a heat exchanger to cool air and condense water vapour into a water tank or through a hose to the outside. It’s ideal for rental situations as these are simple and easy to install, plus it won’t turn your laundry room into a sauna like a vented dryer can by exhausting hot steam. 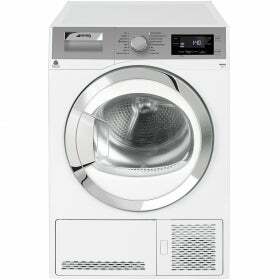 The Smeg SACD82 clothes dryer has a white finish with a chrome/white door. The design also features a stainless steel drum, LED interior drum light and an encoder knob. Additionally, it’s equipped with an indicator for the remaining time, full water tank as well as condenser and filter cleaning. For safety it has a child lock, overheating temperature protection and automatic drum stop for when the door is opened mid cycle. It has a two-star energy efficiency rating and according to the standard test, it can add around $102 to your electricity bills each year (based on 29c/kWh). Heat pump technology conserves and recycles warm air and in turn, the heat pump dryers typically use only a fraction of the energy needed by other types. A heat pump is essential the same as a refrigeration cycle, which absorbs energy from a cooler area and releases in into the warmer area without producing nearly as much heat as a result. It can thus, be put almost anywhere in your home, not necessarily near a window or door. This Smeg 7kg capacity heat pump clothes dryer might be one to consider for a household of three to four people. It’s equipped with 16 drying cycles, including Delicates program and Refresh program for the clothes that have been sitting in the drawers too long. Additionally you’ll find a Quick Dry cycle, ideal for busy households. There are some similar features to the condenser model mentioned above, such as the clean lint filter reminder and water tank full indicator. You can also delay the start time on this Smeg dryer and enable the child lock for safety. Heat pump clothes dryers are typically more energy efficient compared to other types of dryers, and you can expect a six-star energy efficiency rating from this SAHP7 model. It should add around $47 to your annual energy costs, according to the standard test. It further boasts a noise level of 66 decibels. This model features similar design elements to the full Smeg range including a stainless steel drum, LCD (TFT) display and an encoder knob. Additional indicators are also featured – remaining time indicator, water tank full indicator, condenser cleaning indicator and filter cleaning indicator. If you’re in a rush, you might make use of the time delay option, which allows you to have your drying cycle finish for when you get home. It also has an adjustable end program sound and an LED interior drum light to keep an eye on your clothes. To help save on floor space, this dryer comes with a stacking kit, giving you the ability to stack the appliance on a front load washing machine. Similarly, it features the same safety settings that can be found with the models above. If you’re tight on space, another option – rather than stacking your dryer – is to consider a washer dryer combo. These are essentially two appliances in one, giving you both a washer and a dryer, just like the name implies. A benefit of buying one of these units is that you save on space and money, as this type of appliance typically has a lower cost than if you’d buy two appliances separately. Smeg offers two models – the SAWD612 and SAWD814 – one just slightly larger than the other. 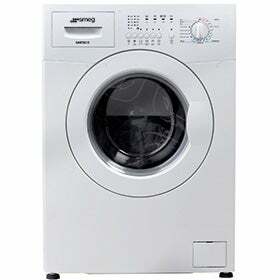 You can choose between a 6kg washer/3kg dryer and an 8kg washer/4kg dryer respectively. 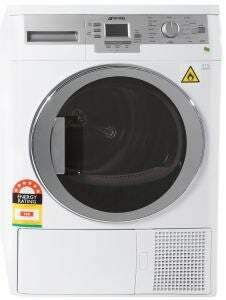 Both models are equipped with 16 washing programs, seven wash temperatures and five spin speeds. It features automatic washing drying, so once the washing cycle is complete it will automatically start the drying mode. You could also choose to delay the start of the cycle, while also adjust the time of drying. Additionally, it’s fitted with automatic sensing to reduce power consumption. 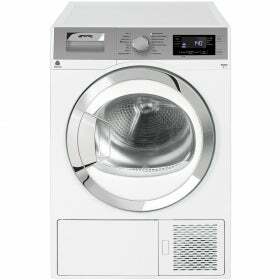 The slightly smaller model – SAWD612 – has a two-star drying efficiency rating, while the larger – SAWD814 – is rated three stars. Are Smeg clothes dryers worth the money? There are a number of options in the Smeg line up, which sit toward the mid-price range. Its heat pump dryers are notable for their six stars and higher in terms of their energy efficiency – with the Smeg 8kg SAHP86 model being rated eight stars. In turn, this might help you save in the long run through cheaper energy bills. It also features moisture sensors, that can help bring the dryer to an early finish instead of running the dryer with already warm clothes inside. And even Smeg’s condenser dryer is equipped with this system, despite having a lower energy efficiency rating, so you can still benefit from not overdying your clothes with the automatic shut off.